When each step is painful, like you've got a rock or marble in your shoe — but you've emptied them and know they're clear — you may have Morton's neuroma. This benign condition happens when the tissue leading to your toes' nerves thickens, impeding sensation and causing burning pain and numbness in the ball of the foot that radiates into the third and fourth toes. Activity often aggravates Morton's neuroma, including yoga. However, when you choose the right poses and perform them mindfully to stretch the toes, you can stop the nerve compression in its tracks. Check with your health care provider if you suspect you have Morton's neuroma, as sometimes only a steroid injection or surgical interventions relieve your pain. Sit on your shins with your knees bent. Lift your buttocks slightly to tuck your toes under. Sit back down toward your heels. Place your hands on the mat in front of you to alleviate some of the pressure on your toes if the sensations are too intense. Stay for five to 10 breaths. This pose can be quite intense, so go slowly and be sure to employ deep yoga breaths to ease your mind and discomfort. If the pain is ever unbearable or sharp and shooting, abandon the posture immediately. Place your mat perpendicularly against a wall. Lie back on your mat. Lift you legs up and scooch your buttocks to touch the wall. Extend your legs up the length of the wall. Breathe for 5 minutes or longer. You can still practice yoga even if standing is painful. Use your mat for seated and reclined poses, but sit in a chair during Warriors and other standing postures. 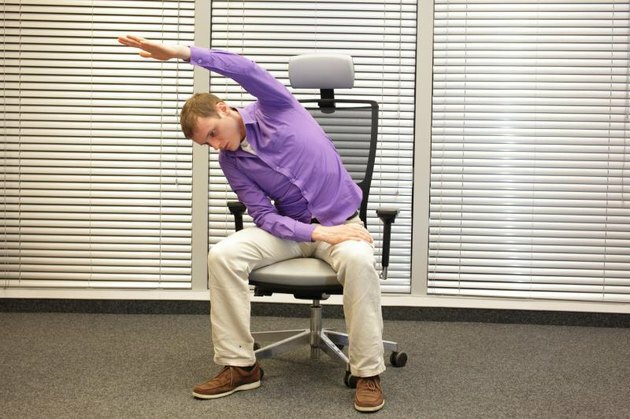 You can stretch your hips, raise your arms and bend your knees, but the chair relieves pressure on the feet. The calming aspects of yoga that include breath work and mediation are available, no matter how hard you make each posture. Balancing poses can be extremely painful when you try to stand on the foot with the neuroma. Tree, Half Moon, Warrior III and Eagle with your affected foot as the base can irritate the foot, rather than heal it. After you regularly practice and experience a possible toe spread and widening of the feet, you might try again with balance poses. Yoga trains your toes to naturally separate, which may relieve the tissue pressure compressing the nerves. The process of change may take months or years, so don't expect yoga to work its magic overnight. In the meantime, your doctor will likely have you deal with Morton's neuroma using over-the-counter anti-inflammatory medications, ice and rest.